Here is a recap of The Dr. Phillips High School Panthers Regional Semifinal game against Vero Beach. Vero Beach looked to make a statement on the opening play of the game, connecting on a deep pass for a 34-yard gain to the Panthers’ 46, which ignited an already raucous home crowd, but the DP defense stuffed a pair of runs on second and third downs to force a punt that gave them possession at their own 16. Quarterback Brenden Cyr connected with Trey Schyck for a pair of first downs to midfield and after a ten-yard pass to Jacquez Jones and a first down run by Japerri Powell, the Panthers had a first down at the Vero Beach 25. Three plays later, junior Riley Stephens boomed a 42-yard field goal with 5:49 left in the first quarter to give the Panthers a 3-0 lead. Vero would respond on their ensuing possession, earning first downs on five straight second down plays to give them first and ten at the DP 13 but the Panthers came up big again when it mattered. On third and one from the four yard line, junior linebacker Stephen Dix and senior safety Jaylin Wodford crashed through and buried the ball carrier for a one-yard loss back to the five. Vero elected to forego the field goal attempt and instead, tried a quarterback keeper on fourth and two but senior linebacker Devon Charitable slipped through a block and stuck the quarterback for a two-yard loss to force the turnover on downs. With the ball at their own seven yard line, Japerri Powell got the call on second and nine, broke outside, and galloped 42 yards down the DP sideline for a first down at the 50. But a bad snap eluded Brenden Cyr on the next play and Vero Beach recovered at the DP 45. Ten plays later, the Indians were looking at second and goal at the one but DP dropped the hammer again. Senior Cameron Williams made the first of his two game-changing plays, knocking the football free before the back reached the end zone and Japerri Powell pounced on the fumble to thwart another stellar scoring opportunity for Vero Beach, but they wouldn’t be held down too long. 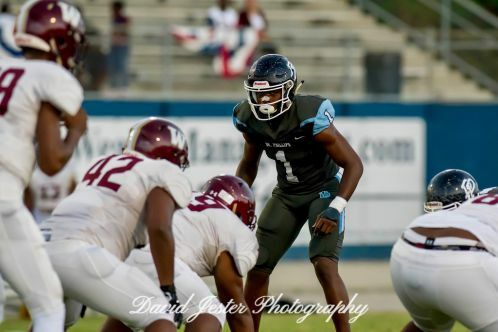 With DP pinned deep in their own end, Brandon Fields broke off a 20-yard run to give the Panthers some room but they were forced to punt after three plays and the Indians took over at the DP 45. Two plays later, a 45-yard touchdown reception pushed the host team in front, 7-3, with 5:15 left in the half. That was the last lead they would own because champions master the counterpunch. DP took possession first in the second half and the game plan was evident immediately: control the line of scrimmage, pound the rock, keep possession and let the clock do its thing. And while DP did not score in the third despite driving deep into Vero territory on both possessions, the strategy worked as the Panthers ate up over eight minutes and Vero’s one possession resulted in a punt. In the fourth quarter, Vero Beach abandoned their running game and went to the air on six consecutive plays but with 10:49 left in regulation, Bryan Bell-Anderson frustrated the host team even more, picking off his team-leading fourth pass of the year. Vero would go quietly on their next drive as well and DP took over at their own 37 with 7:01 remaining. 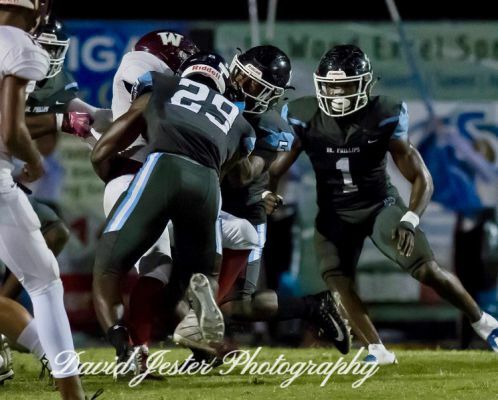 An 11-yard run by Nivon Holland opened the drive and moved the football to the 48 but two plays later, the Panthers faced third and four at the Vero Beach 47. If they didn’t convert, Vero would have plenty of time to drive down the field for a potential game-winning score. Convert, and the Panthers could potentially drive a dagger into the Indians or at least drain critical minutes off the clock. So when Japerri Powell took the handoff and bounced outside to the right, a Vero linebacker shot through to make the tackle but Powell stiff-armed him to the ground, trucked another defensive back coming in to make a play, and lunged forward for a five-yard gain and a first down. Not only did that play, that effort, save the season…it exemplified how a senior with more accolades than he can count, simply refuses to quit or allow his team’s season to end. So with a first down at the Vero 42 and 5:25 left in the game, Japerri Powell carried three more times to the Vero 37 but the Panthers faced fourth down and five. With a 52-yard field goal try a bit too much to ask, the Panthers rolled the dice and elected to go for the first down. If a season-saving play was defined by Powell’s run four plays earlier, then this next play epitomized the heart and determination of quarterback Brenden Cyr, who saved the season as equally as Powell. On fourth and five, Cyr faked the handoff to Japerri Powell, who drew everyone inside to make the tackle, but Cyr kept the football again, and charged ahead off-tackle for a seven-yard gain to move the chains and keep the clock running with just over two minutes left. Two plays later, on second and three, tight end Jackson Hodor and H-back Christian Przybysz blew out the defensive end and a linebacker while left tackle Derek Haupt sealed off the inside tackle allowing Japerri Powell to knife through the smallest of holes and sprint 23 yards untouched for the game-clinching touchdown. All Vero could do was watch. With 1:35 left on the game clock and a 19-7 lead that was essentially insurmountable, the DP defense still came up big. With the Indians driving 54 yards in three plays down to the DP 15, Japerri Powell’s motor was still churning. On first and ten, Vero’s quarterback rolled to his right but Powell chased him out of the pocket and punched the ball free which was scooped up by Cameron Williams, who returned it 15 yards before stepping out of bounds on what could have been yet another dramatic touchdown return from a senior whose career is defined by making the biggest plays at the most opportune times. With the 19-7 victory, Dr. Phillips has now advanced to play for the Regional Championship in each of the last five years and seven of the last nine. 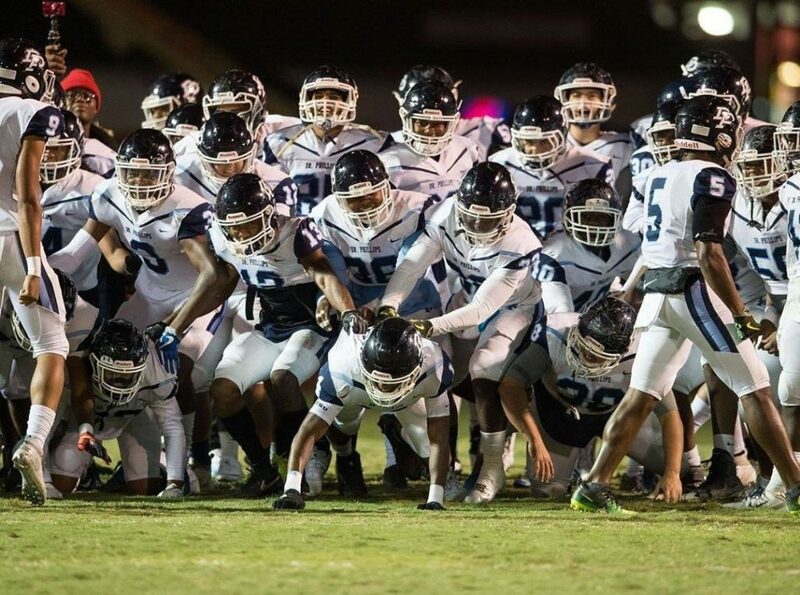 DP (7-5) will now head out on the road again to Sarasota Riverview (9-3), who dispatched Bradenton Manatee Friday night, 49-27, setting up a rematch of last year’s Regional Championship. Kickoff for that game will be 7:30 pm.